Can I give my Timeshare back to the Resort? it will be the best $15 you ever spend on Timesharing, we guarantee it! 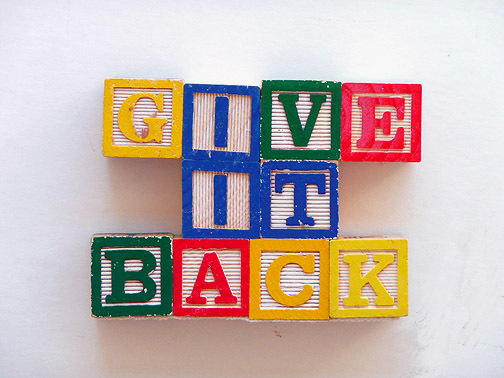 How to Give an unwanted Timeshare back to the resort? The answer to this question, much like every other question in the Timeshare Industry, is: It Depends! Note that the answer is NOT "no", as it truly does depend on the resort in question, the interval you own, your current status as an owner, and finally, how persistent you are! What would prevent me from Giving it Back? If you still owe money or are behind on any fees! This includes any outstanding mortgage payments from the original loan, any unpaid maintenance fees, any unpaid special assessments, or any back taxes owed! Basically, if you owe any sort of money to the resort (or the lienholder), the resort will simply not take this unit back from you (even if it was willing to do so) until these fees are paid in full. Ok, none of that applies to me, how do I give it back? Well the easiest way to get started, is to simply contact the Homeowners Association and ask! You simply wont find many (if any at all) resorts that have a publicized form or webpage or phone number specifically used for "giving your timeshare back"! After all, the resort wants happy maintenance fee paying members, not abandoned intervals. That said, the resort does NOT want to have to foreclose on units as it costs them even more money to do so, or have owners just stop paying...so its a slippery slope that all resorts must battle. Fact is, unless you ask...the answer will always be no! One thing I can suggest, is many resorts by default will say no at the beginning to all requests, however just because they say no at first, does NOT mean they wont take back your unit. There are nearly always situations where a resort will indeed take back an interval, its just up to you to convince them to do so! *Note: Just because your resort or ownership is not listed above, it does not mean that you cannot successfully surrender your ownership using the suggestions listed in this article! These links above are simply for owners to be able to contact the appropriate department to initiate the deedback process using these official programs. Great! The resort said they would take it back now what? In almost all situations, the resort will inform you on the process for deeding the week back to them. Remember, this is a real estate transaction, so its not just a matter of two people on the phone concluding the deal. Sadly there is almost always a cost involved in this process because there are many standard fees that apply with changing the owner on a deed (as is with any real estate transaction). It is also likely the resort will charge you an additional fee (above and beyond the normal title transfer/deed recording/etc fees) for taking the unit back. This many times is negotiable, but in your situation where you can be free and clear of your timeshare all while dealing directly with the resort to give it back, this fee is many times reasonable and fair. That is of course up for you to decide. REMEMBER!!! The TUG mantra is never ever to pay upfront fees, however this applies to 3rd party companies who claim to be able to sell/rent/whatever your timeshare. In most cases you will indeed have to pay your RESORT for them to take this unit back...so you certainly want to make sure that you are dealing directly with your resort with any payments you make. Drat, they said no...now what?? Well, the best advice I can give here is: "Ignore the no and try again"! Just recall when you went to the sales presentation, did the salesman take no and end the presentation right there? Or did he have a response to eventually convince you to buy! A famous quote goes along the lines of "every call is a successful one, you either convince that person to buy what you are selling, or they convince you they arent interested"...its up to you which is which! The unit is completely paid off and you are an owner in good standing. This will always be a requirement, if this does not apply to you, you have little to no chance of the resort taking this unit back from you. Financial circumstances have changed and you simply cannot afford to pay! Examples for this include losing your job/taking a huge pay cut/loss of hours/an unexpected child/major injury/medical bills/etc...the list goes on and on. Now many people may not feel it prudent to share your life story with someone else, but the fact is if one of these situations applies to you and you simply cannot afford to pay your annual fees anymore, the resort needs to know that! This is a big one, many folks simply just keep paying the annual maint fee bills when a significant other passes, you must let the resort know about these situations as they really would have no other way of finding out! Seniors on a fixed income are the hardest hit when it comes to ever increasing maintenance fees, and most come from a generation that would rather keep paying because they are obligated to do so, vs risking not being able to pay other bills. Along with being the most frequently targeted by scammers, it is pretty common to find seniors who simply keep paying maint fees long after being unable to travel on vacation anymore. The resort really doesnt care if you use your week or not, as long as you keep paying the annual fees! You have been contacted by a company that claims they can "transfer" your Timeshare out of your name! These transfer companies have become a real problem for resorts, as many of them simply deed your unit into a fictional LLC or other entity, and abandon it making it impossible for the resort to collect any fees or otherwise contact the new "owner". This has become such a problem for resorts, that many have taken steps in attempt to prevent these companies from taking ownership of their units. While we certainly do not condone (and it is illegal) the use of an organization to transfer your interval into a fake entity for the purposes of defaulting on the payments, the fact is the resort is better off taking this unit back from you (for applicable fees as mentioned above) than it is trying to get the unit from one of these entities. Ask them to tell you why its possible for these companies to take your unit from you, but not the resort that sold it to you! The TUG Timeshare Marketplace is one of the largest and most visited timeshare classified ad sites on the internet with etns of millions of dollars in completed listings and thousands of current ads posted by owners! All ads are open to the public and do not require membership to browse! TUG Members receive free ads to sell or rent a timeshare all year!